Extract a larva showing suspicious symptoms with the spatula. You can sample several larvae or scales if needed, BUT don’t put too much organic material in the sample bottle – it may clog the device. Only tiny tiny samples are needed. The kit performs as well as standard AFB laboratory tests. It has been validated by the National Bee Unit of the Food and Environment Research Agency (FERA), York and at other institutes internationally. It has been developed for Vita by the Foresight Diagnostics section at FERA in York, UK. A positive result (two lines show up – both Test and Control, see below) indicates that the target pathogen is present in the test sample, that is that the cell sampled contained infection by American Foulbrood. A negative result (Control line shows up only, no Test line) indicates that the AFB pathogen has not been detected in the test sample. Faint blue T line, strong C line indicates a possible positive, test performed OK. Note: As with all diagnostic testing a negative reaction does not necessarily indicate that the target pathogen is absent. A faint or absent line may indicate a low concentration of the pathogen or recent infection. If in doubt repeat with a new device using a fresh sample or repeat in a few days time. 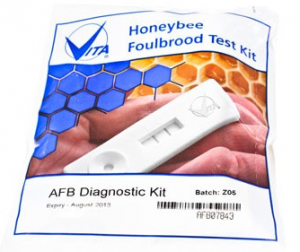 See also Vita’s European Foulbrood (EFB) diagnostic test kit.